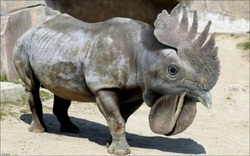 Use your photo editing skills (Photo Fusion, PhotoWizard or other photo-editing app) to create a new breed of animal. Start your own urban legend like that of the lonely Jackalope. For this project you will use one of the two photo editing apps above or another photo editing tool to combine images and/or edit an existing image to create a new animal. Keep track of your process, as you will have to describe it when submitting your completed project. You will also need to submit any original images you used to create your final image. Be sure to come up with a name for your new animal. Create a NEW Blog Post to tell everyone about the new animal you have discovered. Have fun with this! from? --- how did you discover it? Create another NEW Blog Post to tell how you did your photo editing. - What challenges did you have? - What was your favorite part of the process? Was it fun to do?